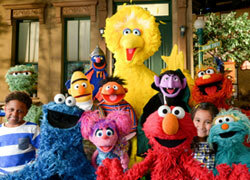 Your Thoughts: Sesame Street on "Cake Boss"
Discussion in 'Sesame Appearances' started by Phillip, Jan 17, 2010. Don't forget that this Monday night, January 18, Sesame Street will be appearing on TLC's program "Cake Boss" starring Buddy Valastro at 8 pm central, 9 pm eastern. The official listing says that "Everyone at the bakery couldn't be more thrilled to make a cake for Sesame Street's 40th anniversary but this cake is no walk in the park and problems arise early. Buddy also creates a very special surprise for his favorite Sesame Street character." Ryan ("theprawncracker") reports that Cookie Monster will be receiving a large cookie, so we'll have to wait to see what happens. Last July, Sesame Street cakes were made on the show "Challenge" to highlight Sesame's 40 years. Yessh, this guy's nuts! He's already started yelling at his crew! I know it's Sesame Street and all, but he's overreacting. Thats just the way they work... I bet alot of it is for the camera.... they are very emotional. Its actually a fun show. I must say appearance in the show is very funny and just like him to act this way around the cast. Good gravy the whole cast, and i mean the WHOLE cast and crew is there. I LOVED Cookie wheeling the tray of cookies away! And the brief part with Telly and Zoe was great too! I thought it was very nice. But, it's a shame that Ernie didn't say anything. I don't watch the show, often except for this particular episode. I agree that the guy is nuts! Still, it's an honor for them to make a cake for something as special as Sesame Street and the finished product was awesome! I especially loved it when Cookie Monster took the large cookie away from everyone else! Yes, the last segment of the show was just fantastic. It was great seeing all the cast - even Loretta Long, Bob McGrath, Jerry Nelson and many other Sesame team members from behind-the-scenes got some screen time. Great stuff. I forgot about it until it was already too late! PHOOEY! It's repeating tonight at 8:00 (EST), so if you're not busy then, you should be able to catch it again. My favorite line through out the whole show was "ITS SESAME STREET! SESAME STREET MAKES YOU HAPPY! I'M SUPPOSED TO BE HAPPY, BUT I'M NOT! I'M FRIGGIN' FRUSTRATED!" 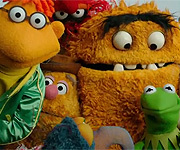 I also liked his little bit with Cookie Monster at the beginning, because to be with your favorite Muppet from your favorite street has to be a golden moment in your life; I remember reading the memoir of one guy who was on the set one day in the mid 90s, rambling on to Frank Oz and blurting out "Can I have a picture taken with Grover? ", feeling totally embarrassed afterwards, but Frank obliged. That was a pretty awesome cake I have to say, I'd kind of hate to have to eat personally, but cakes don't last forever... unless it was that 18th century piece of cake Elaine at that J. Peterman won at an auction. Buddy does some pretty amazing cakes... though I thought Elmo looked kinda funny. But oh well. Lol, I also like how Buddy INSISTED on doing Cookie himself since Cookie was his favorite. I also forgot to mention I LOVED how dumbfounded Cookie looked when they presented that HUGE cookie to him. And then there was giant Bert on the cake. I don't remember much of Bert, but I remember how they handed Ernie to Ernie, and how much he liked that, lol. I'm watching it right now, they just went to commerical with one for that disgusting show Toddlers and Tiaras, . I'm enjoying it so far though, I love how much this boss guy loves Cookie Monster, godda love that. This makes me really want to see some professional grade Sesame figures and playsets. Hope that happens sometime with the Hasbro deal. The Elmo kind of reminded me of when Kevin pulls back on his eyes to make him look like he's rolling them.